Sweetened red bean paste is a staple of many Asian desserts, but I never really liked it growing up– compared to the other available dessert standards (chocolate, vanilla, etc. ), it was just too “beany” for me to enjoy. But that all changed when I grew up and tried the incredible Azuki Bean Cream Puff at a local French-Japanese bakery. The pastry has a thick layer of red bean paste on the bottom, and then is filled to bursting with sweetened whipped cream. I still haven’t figured out how they managed to make the flaky pastry so close to spherical when full, but I’ll do it eventually! In the meantime, I made do with regular choux pastry and made cream puffs. These are split, spread with red bean paste, and filled with stabilized whipped cream. Delicious! The lightness of the cream contrasts beautifully with the dense, sweet, slightly earthy red bean paste, and the pastry adds a little textural interest to the dessert. So I was looking for something simple to make for a thank-you gift for some friends who did us a favor– I always promise baked goods for things like this. Since our friends had little kids I wanted to make sure that whatever I made was relatively mess-free, as well as being easy to eat and not too outrageously sugary. When I thought of palmiers I knew I’d hit on the right idea. But you know me, I never let well enough alone– I wasn’t going to go to the trouble of making my own puff pastry (it never turns out well for me) so I had to doctor them up somehow. When I was in Paris I finally got the chance to try the famous Gateau St. Honoré– a toothsome confection consisting of a layer of puff pastry, topped with a piped choux pastry swirl, topped with a ring of caramel-dipped cream puffs, and filled with fluffy cream. It was rich, decadent, and begging to be reproduced at home. Of course, I can rarely leave well enough alone, so when I decided to try making one I thought it would be delicious to incorporate elements of another famous French dessert, the Paris Brest. Paris Brest is made of a large ring of choux pastry (meant to resemble a bicycle wheel, as the dessert was created in honor of a bicycle race), which is split and filled with a praline mousseline cream. The praline is made of caramelized hazelnuts and almonds, pulverized until they turn into paste, which is then folded into the cream. 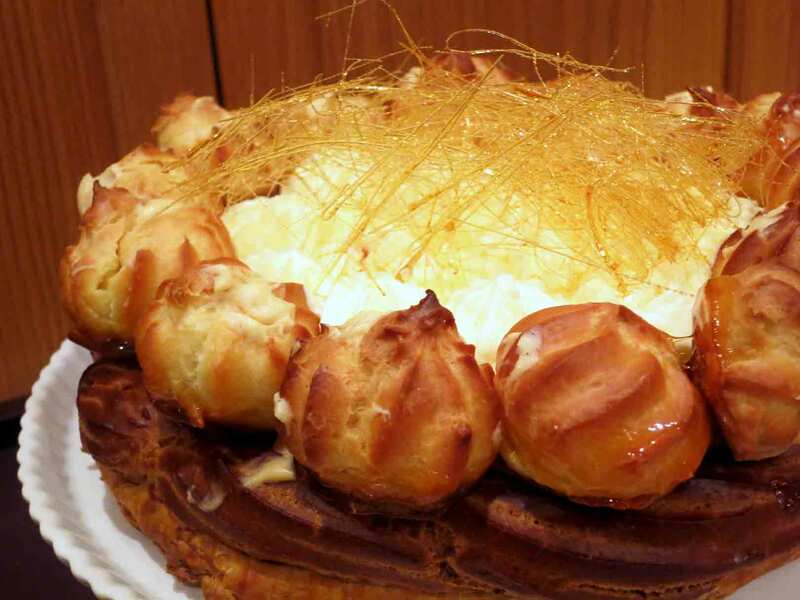 I actually vacillated between which of these desserts to make, as both sounded fantastic, but in the end the Gateau St. Honoré– being both more complicated (I always love a challenge) and involving puff pastry, which I always adore– won out. But instead of the regular chiboust (mixture of plain pastry cream and Italian meringue) to fill the center, I made two changes: First, I used diplomat cream (mixture of pastry cream and whipped cream) instead of chiboust cream, because I hate making Italian meringue– too fiddly with the sugar syrup. Second, I decided to add praline paste to the cream to deepen the caramel flavor of the dessert. The result? Spectacular. The flakiness of the puff pastry base adds just enough textural interest to the slightly firmer choux pastry and the gobs of creamy, hazelnut-kissed filling. The hard caramel dip on the cream puffs is just enough to crunch between your teeth and provide a hint of bitterness, and the dessert as a whole is light yet rich. I will absolutely make this again the next time I need an impressive finish to a meal.